The world’s largest 3-D printed reef was submerged on August 11, 2018 at Summer Island Maldives, in what is hoped could be a new technology-driven method to help coral reefs survive global warming. The artificial reef, assembled with hundreds of ceramic and concrete modules, was submerged at Summer Island’s ‘Blue Lagoon’ — a sandy part of the lagoon, where the resort hopes to create a new coral reef ecosystem. Industrial designer Alex Goad, of Reef Design Lab, from a Melbourne (Australia) lab used sophisticated computing modeling to design reef structures similar to the coral reefs found naturally in the Maldives. A large 3-D printer printed moulds of the reef structures within a 24 hour period. These moulds were cast in ceramic — an inert substance, similar to the calcium carbonate found in coral reefs. The ceramic moulds were shipped to the Maldives, and filled with concrete on the beach at Summer Island. Two hundred and twenty ceramic, concrete filled moulds were then slotted together, like a giant LEGO set, to create the new reef. The new reef sits in seven metres of water, close to the resort’s existing coral nursery. Fragments of coral from the nursery are being transplanted onto the 3-D reef, where they will grow and colonise the structure. “3-D printing technology helps us to develop more innovative ways of protecting coral reefs. 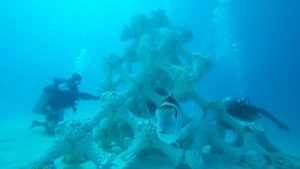 The technology allows us to mimic the complexity of natural reef structures, so we can design artificial reefs that closely resemble those found in nature. We hope this will be a more effective way of growing and restoring corals,” said Alex at the event. In a year or two, when the corals have grown over the 3-D reef, the resort hopes to have a new, natural looking reef, teeming with fish and marine life. If the 3-D printing technology proves more successful at growing corals than existing coral propagation methods, it could be a novel way of helping coral reefs survive a warming climate. Rising sea temperatures pose a grave threat to the world’s coral reefs, and mass bleaching events are becoming more common and more severe.The Maldives is one of the world’s most climate-vulnerable nations. 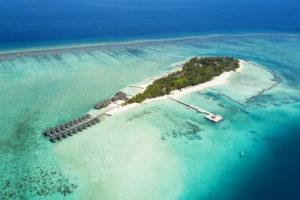 Summer Island Maldives has implemented a number of recent environmental initiatives, including the adoption of solar energy, a ban on the use of plastic straws, phasing out imported drinking water, and coral conservation projects. What an amazing, informative, useful and hopeful site! Kudos!